Fashion classical satin overbust is covered with a layer of floral black lace for added detail. Cut shorter at the back for added comfort. High quality hook and eye closure in front, lace-up in back for cinching, matching g-string, plastic bone, without back vanity panel. Size from S to 6XL.Please use our own Size Chart guide located on the left of the product image do NOT use the Amazon size guide.and choose the proper size based on your waist size.Please choose the upper size if you are not quite sure about the sizing. 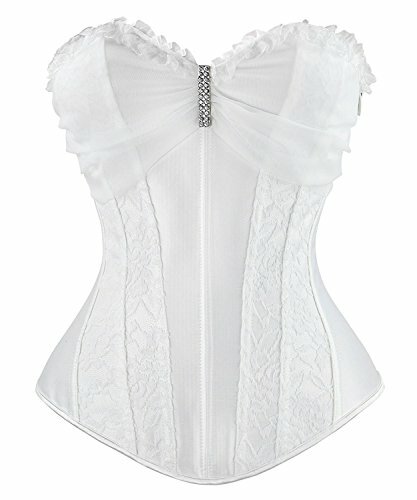 Perfect for wearing under an outfit as a shapewear corset or showing it off for some party fun bustier costume.The Satin Corset waist training corset shaper makes for a fabulous accessory, whether you're looking to purchase a fashion corset, cosplay corset, or simply trying to spice up your style.Features:2 steel bonings at Front,10 plastic bones,Hand-washing onlyItem length: front 14.5inch(the longest),back 12inchHook-And-Eye closures for precision fit Lace outside lining,lace criss cross adjustable lacingStrapless,Cotton Inner Lining,Firm CompressionYou can wear Zhitunemi waist trainer at anytime you're going to be active. Take it to the gym or for a run outside and let it add impact to your healthy lifestyle routine.Corsets must be worn-in gently, if you tighten them up too much too quickly it can damage the corset. When you first put your corset on pull the lacing so it fits comfortably and snug but not too tight, after a while you should feel that the material has stretched slightly/your body has got used to the fit, so you will be able to tighten some more, this could happen a few times until you have it at its tightest fit. Corset size chart attention: Corset Hand-washing only Gender:Corset for Women Plus Size Top Type:Beautiful Vintage Style Lace up Corset Overbust Item name:Fit for Fashion Corsets and Bustiers Elegant Women to Dress for Party, Fashion Show, Cosplay,Halloween Costumes Corsets or Other Occasions, Of Course You Can Dress it as Casual Wear.Corset Great for waist training, If your waist measurment is between two size, please choose the smaller size.If you are not sure what size you would .Please leave your measurment to us,we can pick up the size for you item includes: one corset and one G-string S Waist:24"-25" M Waist:26"-27" L Waist:28"-29" XL Waist:30"-31" 2XL Waist:32"-33" 3XL Waist:34"-35" 4XL Waist:36"-37" 5XL Waist:38"-39" 6XL Waist:40"-41" Corsets must be worn-in gently. If you tighten them up too much too quickly it can damage the corset. When you first put your corset on pull the lacing so it fits comfortably and snug but not too tight, after a while you should feel that the material has stretched slightly/your body has got used to the fit, so you will be able to tighten some more, this could happen a few times until you have it at its tightest fit. 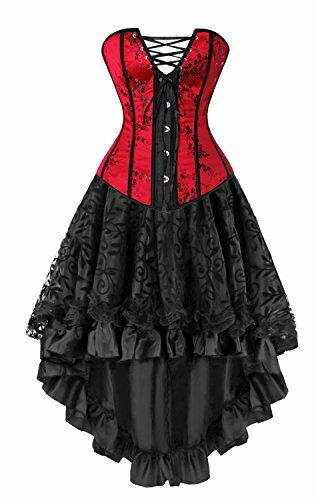 Corsets are sized by waist size. So please choose your corset according to your waistline. not your bust. If your waist measurment is between two size, please choose the smaller size. 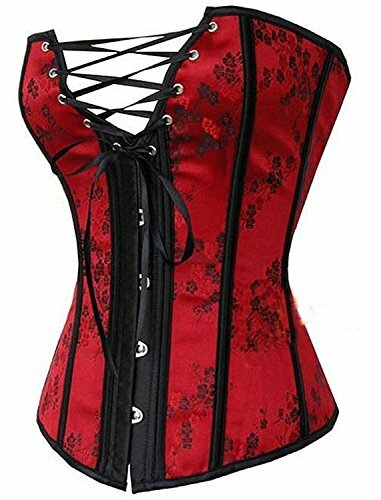 If you have any question about the size, please contact us.Blidece Women's Corset Size ChartS, Bust:32"-34",Waist:24"-25",Hips:34"-36" (US Size 4-6) M, Bust:34"-36",Waist:26"-27",Hips:36"-38" (US Size 6-8) L, Bust:36"-38",Waist:28"-29",Hips:38"-40" (US Size 8-10) XL, Bust:38"-40",Waist:30"-31",Hips:40"-42" (US Size 10-12) 2XL, Bust:40"-42",Waist:32"-33",Hips:42"-44" (US Size 12-14) 3XL, Bust:42"-44",Waist:34"-35",Hips:44"-46" (US Size 14-16) 4XL, Bust:44"-46",Waist:36"-37",Hips:46"-48" (US Size 16-18) 5XL, Bust:46"-48",Waist:38"-39",Hips:48"-50" (US Size 18-20) 6XL, Bust:48"-50",Waist:40"-41",Hips:50"-52" (US Size 20-22)These fashion corsets are perfect for parties,cosplay,club, a night out, or just a bedroom lingerie. It will make you look and feel amazing. Corset size chart attention: Corset Hand-washing only Gender:Women Corset Top Material:Corset Bustier 90% Polyester and 10% Spandex Type:beaufitul vintage style Lace up Corset Overbust Item name:Fit for Elegant Women to Dress for a Party, Fashion Show, Cosplay or Other Occasions, Of Course You Can Dress it as Casual Wear.Corset Great for waist training, costume and fashion corset.If you are not sure what size you would .Please leave your measurment to us,we can pick up the size for you item includes: one corset and one G-string S Waist:24""-25"" M Waist:26""-27"" L Waist:28""-29"" XL Waist:30""-31"" 2XL Waist:32""-33"" 3XL Waist:34""-35"" 4XL Waist:36""-37"" 5XL Waist:38""-39"" 6XL Waist:40""-41""